Awaken Network helps churches begin to understand, talk about, and to minister to people with a better understanding of abuse. The realities of domestic violence, child sexual abuse, and the abuse dynamic are often not well recognized or handled when they do come to light. Awaken facilitates conferences in churches, and connects the church with resources that will make them able to recognize and handle abuse more effectively. We have observed that our society, churches included, suffers broadly from a lack of awareness about what constitutes abuse. We believe the most critical difference we can make is to raise general social awareness about abuse. A part of Awaken Network resources will be dedicated to educating church leaders specifically, and these events will be labeled Awareness in Ministry, or AIM. In fall of 2016, We obtained training in running survivor support groups (through ARMS in Spokane, WA), and have since launched the first Her Journey Support Group on the Palouse. In spring of 2017, we obtained training in facilitating Mending the Soul small groups, which are trauma-informed small groups for survivors of abuse, and have since launched the first MTS group on the Palouse. 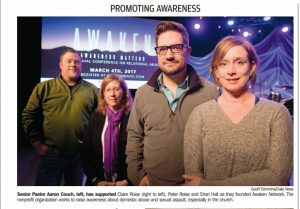 During 2017, we sponsored and ran the first Awaken Conference on abuse awareness. The conference was hosted by Real Life Church in Moscow, Idaho, and was attended by around 200 people. The conference in its entirety is available online at www.awakenidaho.com. We followed the Awaken Conference during 2017 with semi-yearly Breakout Sessions. Our objectives with the Breakout Sessions were 1.) to make ongoing education available to our local church home. 2.) to begin building an online and shareable video resource library. We produced four sessions: Safe People 101, Mandatory Reporting 101, Red Flags in Dating, and Healthy Relationships. These sessions are now available online at www.awakenidaho.com. In February, 2018, we hosted our first training aimed specifically at educating church leaders to understand and respond to domestic violence as they encounter it in their counseling rooms and daily lives. This was our first “Awareness in Ministry” (AIM) event. Future AIM events will address understanding and responding appropriately to Child Sexual Abuse. This event was also recorded and can be provided to interested ministry leaders upon request, just email us at awakenidaho@gmail.com and ask for the AIM 2018 Recording. In March, 2018 we launched a Batterer’s Intervention Program (Duluth method) in Moscow. Our “Turning Point” classes meet weekly in a three weeks on and one week off schedule. As far as we know we’re the only program specifically focused on helping men stuck in destructive behaviors in their marriages available in our region. The nearest BIP is an hour and a half drive, and in Washington State. To pioneer a set of coordinated community response protocols for dealing with DV in a church and counseling context. To continue building an online shareable video library resource. To facilitate our second Abuse Awareness Conference, in March of 2019. The second conference will be open to attendees from all local churches. Donations will be used to fund AIM (Awareness in Ministry) events, cost of speakers, our semi-yearly breakout sessions, and our yearly “Awaken, Awareness Matters” Conference. Awaken Network is a non-profit 501c3 organization and your donations are tax-deductible.